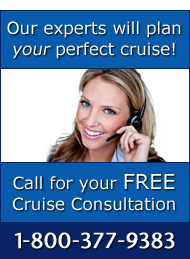 By Raquel Grinnell, Cruise Consultant, The Cruise Web, Inc.
We all know that one of our favorite things about cruising is the incredible food available pretty much 24/7 (most of us just won’t admit it!). Of all the courses at the dinner table, none is dearer to the heart of children of ALL ages than dessert. Royal Caribbean has so many options for satisfying that sweet tooth, whether you choose a confection after dinner in the dining rooms, stop by the ginormous dessert station at the buffet or follow your nose to the Cupcake Cupboard located on their newest ships such as Oasis of the Seas and Allure of the Seas. A visit to the Cupcake Cupboard is like stopping by your neighborhood bakery, especially those amazing, tantalizing smells wafting through the ships! The miniature cakes are baked fresh daily, and if you are so inclined, you can even take a class in cupcake decorating and let your imagination run wild with different frostings, sprinkles, and other toppings. 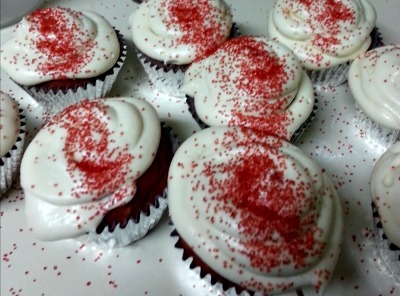 Of the many flavors offered at the Cupcake Cupboard, none is more popular than the Red Velvet Cupcakes. This treat is so beloved that guests have begged for the recipe, and we’ve got it to share with you. This recipe makes a dense, subtly cocoa-flavored cake with a nice crumb – make sure that you have napkins available when serving! My 10-year old neice and I decided to try our hand at baking these cupcakes this past weekend, but unfortunately there was not a recipe for the accompanying vanilla cream cheese frosting, so we whipped up our own. After all, what is a cupcake without the crown of sweet, velvety goodness that is frosting? Do remember to make the frosting first so that it has time to chill in the refrigerator while you’re mixing the batter and baking the cupcakes. We made a few substitutions to the garnishes; white chocolate chips for the white chocolate curls (who has the time to make curls?) and rather than sacrificing a cupcake to make the crumbs Royal Caribbean sprinkles atop their cupcakes, I broke out the red sugar sprinkles from my Christmas cookie baking stash to allow my niece the fun of decorating each one with a smattering of red. Note: the red gel paste food coloring used can be a little harder to find than the traditional liquid food coloring, but it is well worth it. The one teaspoon of gel called for in the recipe is equal to 3 ounces (or 3 shot glasses!) full of liquid food coloring. 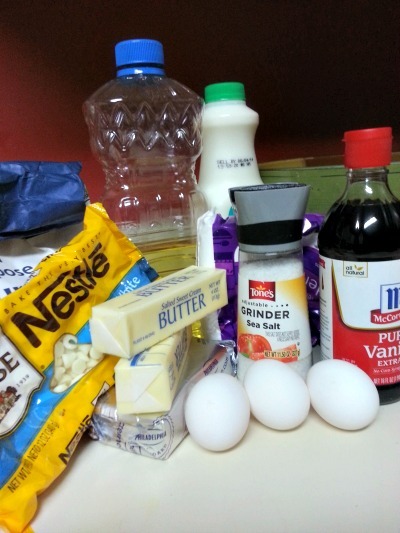 You technically can substitute it, but that’s a LOT of liquid to add, which will affect the texture of the cupcakes. Also, I’m sure you don’t want that much dye in your food. Gel has a much stronger color, and you’ll be using less additives. I found it easily at my local craft store, which has a large baking section, as well as the piping bag and icing tip. Beat cream cheese and butter in a large bowl at high-speed until fluffy, about 1 minute. Beat in confectioner’s sugar one cup at a time, beating until smooth each time. Beat in vanilla, then chill in refrigerator, stirring often, until consistency has stiffened enough to pipe well, about 30 minutes. Line muffin cups with paper liners. Whisk flour, cocoa powder, baking powder, baking soda and salt in a medium-size bowl. In a small bowl, combine buttermilk, vegetable oil, red gel paste food coloring and vanilla extract and mix well. Beat butter and sugar for about 4 minutes (until creamy and light in color) in a medium bowl, with an electric mixer at medium speed. Add eggs to the butter and sugar mixture, one at a time, beating well. Reduce speed to low and slowly incorporate flour mixture and buttermilk mixture. Beat for 2 minutes or until well mixed. Spoon half of the batter into plastic sandwich bag. Snip a ¼ inch corner from the bag and fill the liners two-thirds full. Repeat until all the batter has been used. 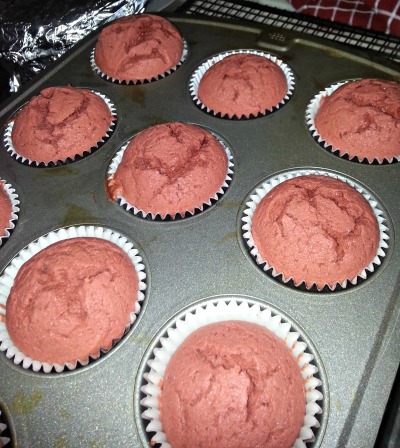 Bake for 18 to 20 minutes or until a toothpick inserted in the center of the cupcakes comes out clean. Spoon vanilla cream cheese frosting into a piping bag or sandwich bag fitted with a large round tip. Pipe icing onto each cupcake, swirl the tip with your wrist as you pull up to form a peak. Garnish cupcakes with white chocolate curls around the edges and sprinkle the tops with red velvet cupcake crumbs. Children especially will love helping make these pretty red cupcakes – it’s so much fun to beat the creamy frosting, stir the red gel into the cocoa-colored batter and watch it turn crimson, and of course licking the bowl is always the best part! These cupcakes came together very easily, baked quickly, and from start to finish were done in less than an hour – perfect for impatient little people craving a sweet snack. So go on – get baking! Hello my husband and enjoyed a cruise on the Allure of the seas its first year out. Cupcakes were sent to our cabin before porting. They were not from the cupcake shop on board. I’d like to send to friends getting ready to take a cruise. Do you have any idea who makes them? Thank-you very much. I think they were real vanilla bean recipe.